Dealing with baby separation anxiety can be tough for parents. 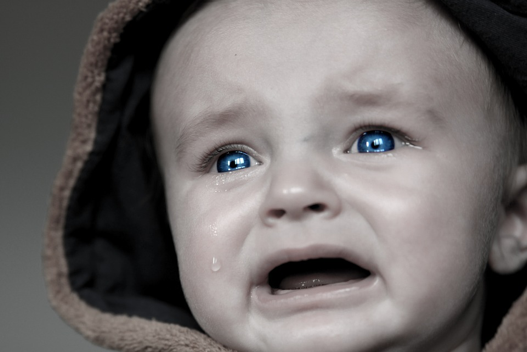 Babies naturally cry when being separated from their main caregivers, even the person watching them is someone they know. When you have to go to work, or even need a night out on the town, chances are you are going to have to leave your baby in the care of another person. It helps to understand why this happens, about what age separation anxiety starts, and things you can do to lessen the trauma. Read further to get the information you need to help you minimize the anxiety for both you and your baby. Separation anxiety in infants and young children is actually a very normal developmental stage. They are learning more and more about their world. Just like when you place a block or favorite toy underneath a blanket, and baby thinks it has disappeared, when parents leave the room they think you have disappeared, too. Object permanence is when the object or person still exists, but is just out of sight for a little while. Your baby understands that they cannot see something, they just haven’t quite got the full picture that the object or person will be seen again. It also comes down to survival instinct. Your baby cannot feed or care for himself, and when a parent leaves them, they feel anxiety and fear over not having their needs met. Keep in mind that your baby will soon learn that other people can care for him/her and they will not go hungry without you there. And finally, babies can sense the way their parents feel. Another cause of baby separation anxiety may be your baby picking up cues that you are nervous about leaving them. You may notice your emotions building at the thought of leaving your child even hours before you need to go. Your feelings may range from fear, to guilt, to sadness. Your child senses emotional changes in you and may start to feel nervous. Symptoms of baby anxiety even when you’re not leaving them; wanting to be picked up and put back down right away, crying for no apparent reason, crying at strangers, startles at loud noises, etc. If your baby is unusually fussy, it may warrant a visit with his or her pediatrician to rule out illness, or decide if you are looking at baby separation anxiety. What Age Does Separation Anxiety Begin? At birth, babies only know their parents when they can see or smell them in the room. Once you leave a newborn, their only concern is survival i.e. getting fed, changed, and held by anyone. You can comfortably leave a newborn and they don’t know any different. Separation anxiety in babies begins to surface between the 4th month and 6th month. This is when they understand that you are a different person, and they understand what happens when you leave the room. The issue is they don’t understand time, and think you won’t come back. However, it is kind of like the game of “peek-a-boo,” they begin to understand that even though you have left the room, you still exist somewhere. On average, babies show definite signs of separation anxiety between 9 months and 1 ½ years of age. It reaches a peak around this time, and begins to wane around age 2 to 2 ½ years. Make departures quick. Try not to linger if baby is protesting you leaving. Give a quick kiss and hug. Tell them you will see them soon, turn and walk out the door. They only cry for a few minutes after you leave. Have your caregiver distract them with play or a snack. Do a daycare visit. Before you return to work, take your baby with you to the place where they will be cared for. Let them meet the other kids, and the daycare provider. This will help them see a familiar place when you do have to leave them. Hide toys under a blanket. To help your baby see that things don’t really disappear, place a toy under a blanket, and allow your child to find the toy. This shows them that when they can’t see something or someone, it or they still exist. You can also play hide-and-seek with your child. Showing them that you may disappear from sight, but will always return. Talk to your baby about your plans. Babies can understand your tones. Talk gently to your little one about what you are going to do. You can say things like, “mommy and daddy are going out for a little bit, but we will be home to kiss you goodnight.” Even just hearing your reassuring voice will help calm anxieties. Calm your nerves. Try to breathe and stay calm about leaving your baby. They will sense you are upset and follow along with how you feel. Try not to cry if your baby cries. Keep a cheerful, and upbeat attitude. You can always cry in the car after you’ve left. Have other caregivers over while you are home. If you are thinking of having people babysit while you are away, have them over while you are home. Include them in things like; diaper changes, watching movies with baby while you are in another part of the house, feedings, and even putting baby to bed.